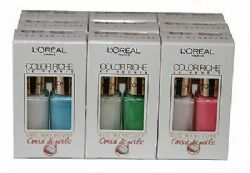 Get the ultra-sophisticated look from the 1st ever manicure kit from L'Oreal Paris. Includes special angled brush for precise & easy application. Boxed & Brand New, Clean stock, All have never been opened, Ideal for selling on at car boot sales, shops, ebay.